Harold “Elvis” Schulz wears a red-and-white shirt, blue jeans, and white boots when he’s Country Western Elvis. He wears a G.I. Blues uniform when he’s Army Elvis. He wears a black velvet shirt, gold vest, and white patent leather shoes when he’s Return to Tupelo Elvis. For over a decade, Schulz and his trio, Young Elvis and the Blue Suedes, have been performing strictly 50s tunes for thousands of adoring fans at nursing homes, corporate events, and weddings around the world. Schulz’s natural resemblance to The King is striking. For shows, he simply applies Suave Mega Hold hairspray and some red chapstick, and he’s ready to go. Even Elvis’ own stepbrothers tell him he looks like Elvis’ ghost. Biggest crowd: 10,000 people in Kansas City for New Year’s Eve in 2008. Average crowd: Anywhere from 40 to 5,000. Total number of shows: In the thousands. In my busiest month, I worked 19 shows. How you got the job: My ex-wife was garnishing wages from my corporate job, so I only had about $400/month to live on. To make some extra money, I started singing karaoke at different venues for fun. I entered a contest and happened to sing Elvis, and the DJ called me afterward. He asked if I had ever thought about being an Elvis impersonator, and my first thought was, I’m not a fat guy, and I’m not putting on a white jumpsuit. What changed your mind? He told me I could make $500/hour performing, which perked my ears up. I started practicing, and made $850 for 45 minutes during my first gig. After I was laid off from my corporate job, I decided to go into showbiz full-time. How do you resemble Elvis? My hair lifts high like his, and we’re the same height and weight. I also practice all his mannerisms, like singing to the microphone and the little inflections in his voice. 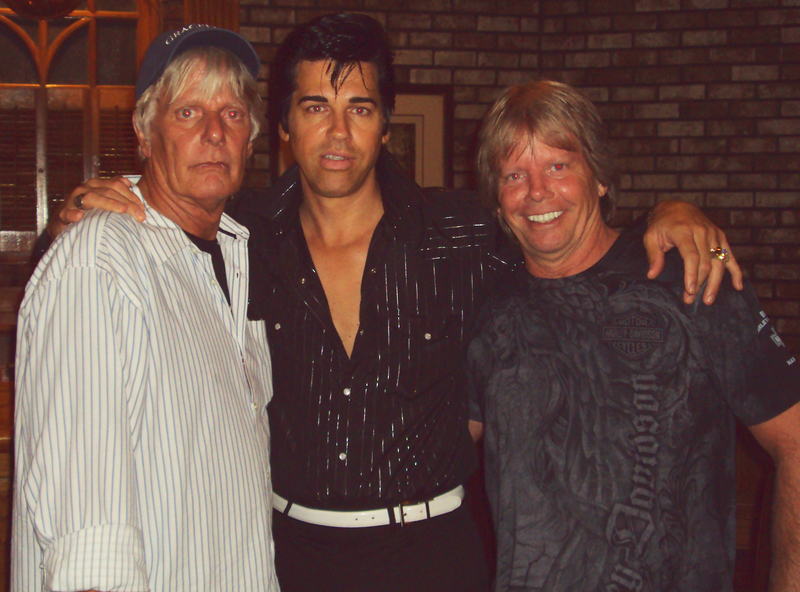 Schulz with Elvis' stepbrothers, Rick Stanley (L) and Billy Stanley (R). What makes your show unique? All our instruments – including our microphones – are vintage, meaning they’re worth about $145,000. My group is officially endorsed by Rick and Billy Stanley, Elvis’ stepbrothers, and Billy once told me that it freaks him out how much I look like Elvis. How many guys do you work with? A trio, just like the original Elvis trio: a drummer, guitarist, and bassist. We also do some Frank Sinatra and Dean Martin shows. And you do all the singing? Yep, and I play some acoustic guitar, just like Elvis did. I’m pretty much a one-man shop: I manage the marketing, bookings, advertisements, video editing, production, web design, and sales. My business background helps with all of that. Where do you perform? Lots of nursing homes, retirement homes, and events like the Special Olympics. But to pay the bills, I’ll do larger venues, like performing arts centers, corporate events, the occasional casino, and private parties – weddings, anniversaries, and birthday parties. Do you travel across the United States? All over the world, actually. If they’re paying, we’re playing. 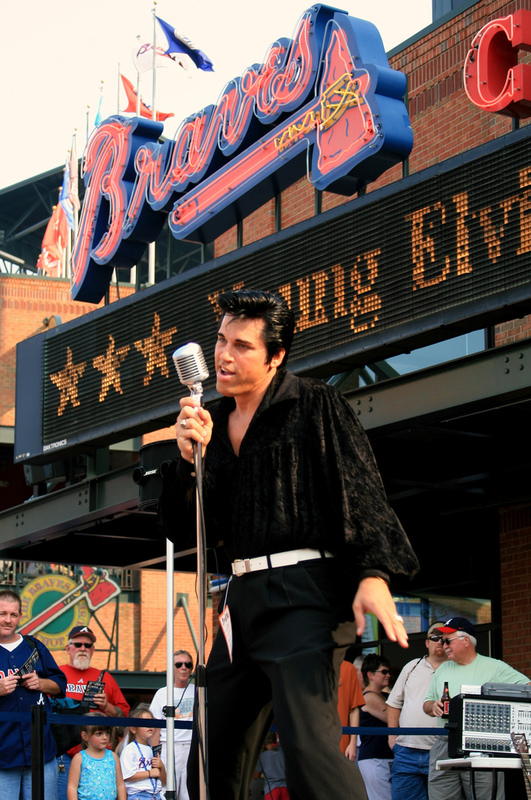 Something people don’t know about your job: Elvis crosses all cultural and socioeconomic borders. We perform for kids to teens to people in their 90s. Playing for older clients is cool, because we’re bringing music back to life that they grew up with. Channeling Elvis' style, Schulz sings to the microphone "like it's his woman." Do you refer to yourself as “The King”? No, never ever, ever. When I’m on stage, I’m on, but when I’m off, I’m off. You seem like a pretty normal guy, but there must be some crazies out there who think they’re actually Elvis. Last year, I went to Elvis Week in Memphis for the first time. Some of the people there made Trekkies look normal. Did you grow up listening to Elvis? 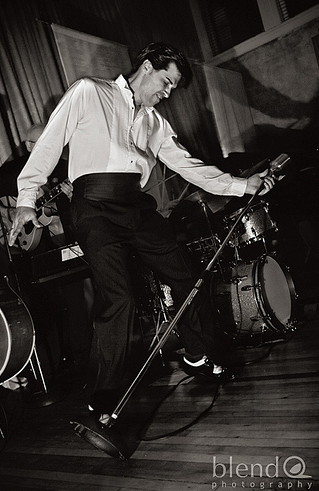 Elvis, Frank Sinatra, Dean Martin, Nat King Cole – all the classics. Is your house decorated with memorabilia? I’ve never bought that kind of stuff, but people always give it to me – 45s, books, framed photos. My living room is decorated very classy, with some 45s and some black-and-white photos from Jailhouse Rock. How do you pump up the crowds? Elvis was always a practical joker, so I’ll do lots of comedy and banter on stage to keep things fresh. I also spend about half the show off the stage, walking around the room and singing to ladies. Funniest memory from a show: Once, I heard a woman whisper to her husband, “That guy must have had plastic surgery.” So I snuck up behind her and said into my mic, “Nope, no plastic surgery!” She screamed. Routine before a show: I’ll apply a little mascara to my eyebrows, some red chapstick to my lips, and occasionally some self-tanner to bring out my eyes. Some of the Elvis impersonators I’ve seen wear so much makeup that they look like French prostitutes. You mentioned an ex-wife earlier. Was she an Elvis fan? She hated it. In the beginning, she pretended to like it, but we couldn’t eat dinner without people asking to take a photo with me. I didn’t mind it. Schulz with a group of adoring fans after a show. So you have lots of fans? Once, during a dinner in Florida, a group of eight girls came up to me to take photos. Their boyfriends were sitting at the next table, giving us dirty looks. I was like, Hey man, they came over to us. Get mad at them. 1. While it’s important to seek the advice of industry experts, think outside of the box. Everyone told me to build a fan base, but I didn’t want to. I like working with new people at each show, so I always go after different venues and fresh audiences. 2. Find a niche in the market. All Elvis impersonators were doing the jumpsuit thing, so I opted to do young Elvis. Also, market your services as selling an experience. 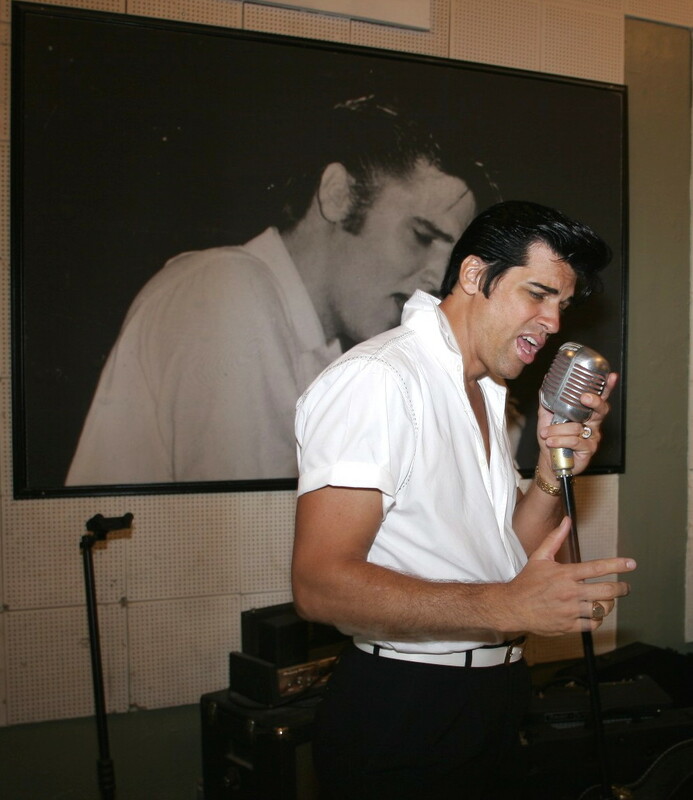 I sell the entire 1956 style, feel, energy, and vintage instruments– not just a guy who looks like Elvis. 3. It helps to have a business background. Otherwise, you’re at the mercy of your manager. Just look at Billy Joel’s $90 million lawsuit against his ex-brother-in-law and former manager; the guy didn’t know anything about his own books. Check out more videos of Young Elvis and the Blue Suedes! Unless stated otherwise, all photos courtesy of bluesuedeent.com. This entry was posted in Cool jobs, Crazy jobs and tagged billy joel, blues, dean martin, elvis, elvis impersonator, elvis presley, elvis week, graceland, harold elvis schulz, jailhouse rock, rock n roll, the king by Megan Hess. Bookmark the permalink.